Even though Britain was at war with Germany, Goodall continued to support the fascist cause. He campaigned for the British Union of Fascist, called the sinking of the German battleship Bismarck ‘disgusting’, and was actually arrested briefly for expressing pro-German views in public. Even after the war Goodall was unrepentant. He was recruited by Walter Legge to take part in a tour of to Germany in 1946. Some of the performers visited the site of the Belsen concentration camp, only to be told by Goodall, who did not make the visit, that Belsen was British fiction manufactured in a leading movie studio. I am linking the following article on Sir Reginald Goodall (1901 - 1990) because not only was he a great conductor, he was also racially and politically aware and paired these convictions with an unusual degree of courage. The Occidental Quarterly is a journal "devoted to the ethnic, racial, and cultural heritage that forms the foundation of Western Civilization". It aims to defend "the cultural, ethnic, and racial interests of Western European peoples" and examine "contemporary political, social, and demographic trends that impact the posterity of Western Civilization". Reginald Goodall being championed by The Charles Martel Society is sad confirmation of Pliable's first law of music, and the great musicians' involvement in repulsive politics once again comes back to haunt him. 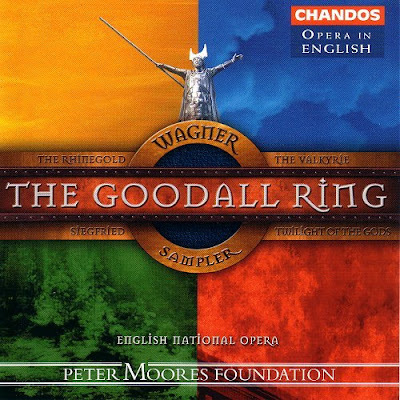 Which is a real tragedy, because as I write the Goodall Ring plays and it is quite simply stunning, a veritable classic of the gramophone that should be in every collection. My original article on Goodall drew on John Lucas' admirably balanced and long out-of-print biography of the conductor, Reggie. Now comes the good news that Lucas' invaluable life of Goodall is being republished by Boydell and Brewer in October in paperback with the new title Genius of Valhalla; it should be in every collection alongside Chandos' reissue of the EMI recorded ENO Ring. And more of music mixing with repulsive politics in Hitler's court composer was a Harvard alumni. There was an interesting article in yesterday's New York Times on how the recent and unexpected uptick in women's fertility levels in "advanced" nations is allowing countries such as Sweden (and Russia, Japan, and Korea?) to contemplate seeking a steady state population through internal growth alone, rather than through the 'immigration-friendly' policies of Canada, the United States, Britain, Germany, France, and a few other countries. I couldn't find the exact link when I looked for it now. This came to mind clicking on your link "Music and Integration" and reading your description of the references to different cultures in Malcolm Arnold's symphonies. Garth, I suspect that guard from the National Gallery in Washington D.C. may have been one of the callers to the recent BBC Radio 5 Live discussion about the future of the Proms that I had the misfortune to take part in. More on the flawed genius of Valhalla tomorrow. Pliable, the conversation started ‘innocently’ enough with the 74-year old Irish Catholic former military guard ‘divulging’ to me that the National Gallery had had to step up security for Abbot Suger’s Chalice (link to picture, below), in the small Treasury collection next to the tapestries, ever since the publication of Dan Brown’s “The Da Vinci Code”, since the Hellenistic 1st c. BCE carved and beveled thin stone 'shell' at the center of the chalice had once held Christ’s blood. Except that it was really hot outside, I don’t know why he was telling me that the NGA had installed three secret cameras and extensive surveillance sensors in the room in the past few years. He also told me, interestingly, that the Chalice had been loaned a few years back to the Moscow Kremlin Museum, which he said holds the five other remaining secret chalice cups which held the blood of Christ and which were used for cultic rituals in the medieval period. Garth, we do even need to go to France to find a 'carved and beveled 'shell''. The shell in that post is still subject to occasional cultic defacing by Aldeburgh locals who don't appreciate contemporary art.